I wish to highlight a number of things. 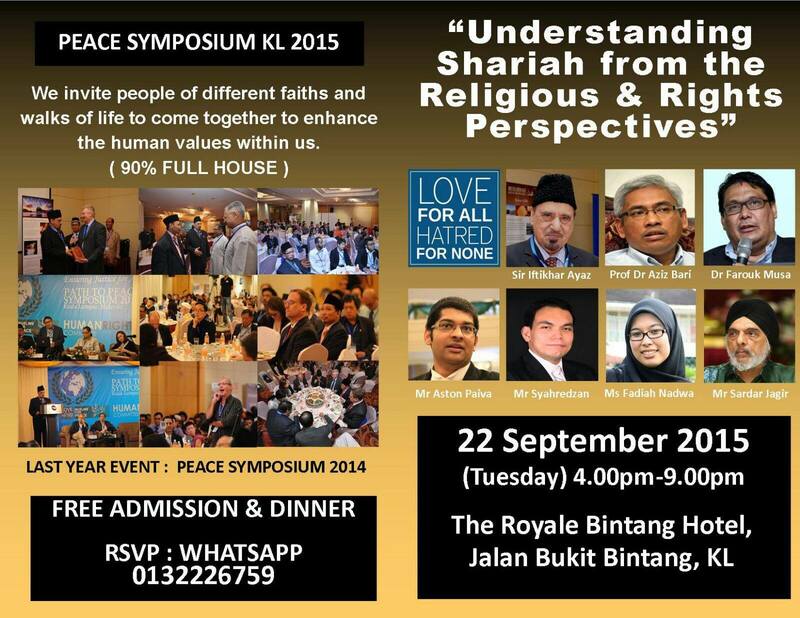 It’s organized by International Human Rights Committee (IHRC) with Projek dialog discussing on shariah. The speakers invited were Farouk Musa, Aziz Bari and Syahredzan. There appears to be no credible people of authority on Shariah. With due respect, NED funded IRF Farouk Musa cannot represent the Muslims here as his views are out of sync with mainstream Muslims views and is not recognized as a credible Muslim authority just like Sisters in Islam despite his poster boy coverage by the left media to misrepresent the Muslims. It is thus unfortunate that international rights committee and Projek dialog had not resorted to a fair balance and robust dialectic discourse on shariah. It appears to be a syok sendiri seminar to deepen further the misconception of shariah. 1) laws have always been a function to reflect social values. Laws on marriages, crimes or decencies are based on religious and social values. 2) judges do decide on their personal values where the values are not expressly determined. U.S. Supreme courts judges are known to be nominated and selected based on their pro or anti abortion stand. It is their values that determine the social values legally acceptable in the society. I don’t have the full text of Aston, but I read this as another push to deny the influence of Shariah or religious values laws in Malaysia through introduction of various different disconnected polemics. The push to not wholly recognize social values in laws has no basis in western laws. Accepting liberal values but denying shariah values are hypocritical and selective. Every day these people build one wall of division after another with selective rhetorics and polemics. The liberals must sooner or later recognize that our constitution is based on a social compromise. It’s not based on absolute idealism. They may have wide coverage of the media to propagate the selective discourse. But so far I am happy that Muslims in general are still steadfast. The negative side effect of this is the ever widening gap of the left and the right. We’ve lost so much empathy and a sad reflection of the state we are in. ← Does China’s government hack US companies to steal secrets? I think there is a misunderstanding of what constitutes “rights” and “liberties” in this context and the depth and dimension of religions and their practices in different cultural jurisdictions. Generalizations do not make for good argument on sensitive topics as Shariah.